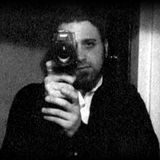 Experimental filmmaker, visual artist and professor of film and photography at UNIMINUTO University in Bogotá, Colombia, in 2007 Enrico Mandirola opened the first laboratory for handcrafted Super-8mm cinema in Colombia, KinoLab-Colombia. Mandirola studied cinema at Dams, University of Turin, Italy. Since 2000 he is a member of the association L’Abominable, an artist run film laboratory in Paris where he experimented for 5 years techniques of Super-8mm film. He is also a member of Cineparallax, a French independent cinema production company. He worked on various film projects as director of photography. Since early March 2011 the Bogota-based filmmaker has been in residence at LIFT (Liaison of Independent Filmmakers of Toronto), Canada. During his residency - supported by the Canada Council for the Arts - Mandirola produced two new films on 16mm in collaboration with LIFT and Niagara Custom Lab. These new films include "El cuento", a 30-minute 16mm reflection on war, and the short "A l'aube". In 2014 he co-directed, with architect Juan Pablo Aschner, "Euritmia", a short documentary that the authors consider an "audiovisual experience" about Rogelio Salmona's architecture.